Flex Probe Station is the most flexible benchtop station for probing with microprobes and PacketMicro’s D-Probes and S-Probes. 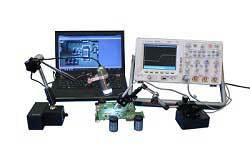 It comprises TP250, FP160, and FP40 positioners, PB100 Bridges, PCB holders, and microscopes. A user can easily configure the Flex Probe Station for probing PCB’s in both vertical and horizontal orientations in minutes. The above setup demonstrates the versatility of the Flex Probe Station that is used to probe a pair of differential traces starting from the BGA pads on a daughterboard in the vertical orientation; going through a large motherboard, a connector; and then connecting to the BGA pads on another daughterboard in horizontal orientation. A 5 megapixel Dino-Lite AD7115MZTL microscope is mounted on a FP160 for the vertical-side probing, and an optical microscope is used for the horizontal-side probing. 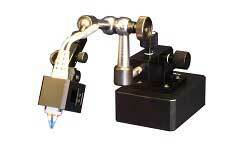 The FP160 makes focusing the microscope easy in all XYZ directions. In the event that you need to probe large motherboard with daughterboard with challenging configuration, Flex Probe Station can save you time and money because there is no need to make or modify the custom probe station, which can be costly and time-consuming. TP250 is designed with the most precise components and built with highest quality; at the same time, it offers the most competitive price in the industry. 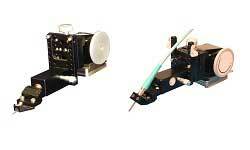 The extra large 2” adjustment screw for y-axis ensures ease of control of microprobe and ruggedized RF probes. Weight: 1190 grams/2 lbs. 10 oz. An innovative probe positioner with articulated arm and an independent precision XYZ stage for quick, accurate and stable hands-free high-speed probing. 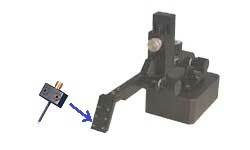 TP150 is designed for PacketMicro’s RF Probes in horizontal probing orientation. It covers boards in a wide range of sizes and heights with the most competitive price in the industry. 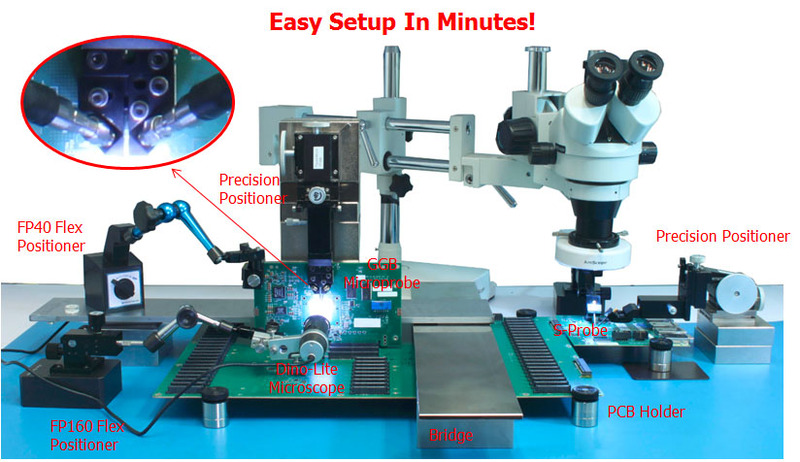 A digital microscope connects to a PC and displays the result on the PC monitor for easy viewing and accurate probing. AM7115MZTL: 5 MP, Polarizer, LWD, 10x~140x. AM4113ZTL: 1.3 MP, Polarizer, LWD, 10x~90x. AM4515ZTL: 1.3 MP, Polarizer, LWD, 10x~140x. AM5216ZTL: 1024x768 resolution, 10x~90x. Connects to monitor directly through D-Sub interface. No PC is needed.